As you know, I really like AK firearms but I also like firearms based on the HK roller lock design. Maybe 3-4 years ago I owned a PTR-KMF4R and it was very accurate and I also learned a lot in terms of maintenance, tuning, etc. Of course, I had to mess with it and add a PRS stock, new trigger, and scope but it really was very accurate. As my interests changed, that rifle was sold to fund other projects but I was impressed. With the reversal of the ATF position on arm braces, I again found myself looking at heavy big pistols that needed braces. I really like the maneuverability of these weapons. While looking at options for my next project, I ran across the PTR-105, also known as the “PDWR“. This thing’s specs rock and I figured out quickly this was my next project. Milled aluminum handguard that uses proprietary removable rails. Note, the PDWR actually uses MP5 handguards so you have a ton of options if you want to try different models. 7.5″ welded top rail for optics, which means no additional optic rail is needed as you typically do with non-PTR firearms. 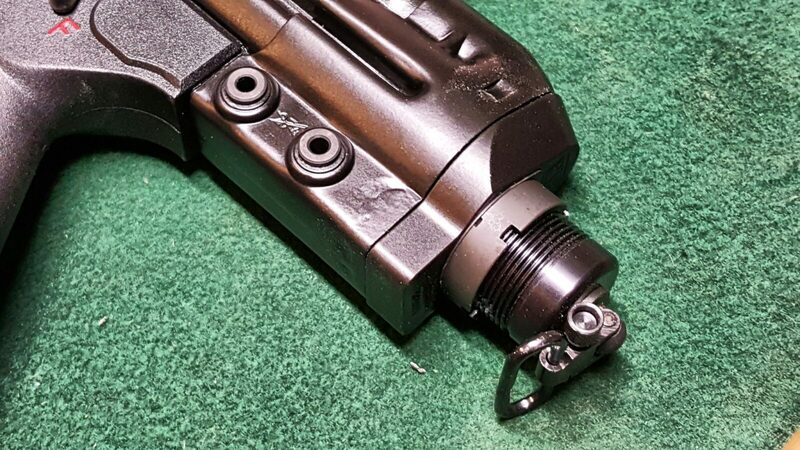 It has a swivel cap on the end that is actually a short tube that is the same diameter and pitch as an M4 buffer tube – which means putting on a buffer tube for a brace would be easy plus not come loose. To this, I should add that you are basically looking at a cut down semi-automatic HK G3/91. This means you have tons and tons of options for magazines and parts not to mention know how. I buy my HK-related parts from either HKParts.net or RobertRTG. Also, for those of you unfamiliar with PTR – they have been around for a while now. They are currently made in Aynor, South Carolina with their original tooling and designs coming from an HK G3 licensed factory in Portugal that they bought in 2003. This helped them really get started and they have been refining their products ever since. So, I did some shopping around and ran into Kelley Enterprises via Gunbroker. They had great reviews there so I also visited their website and met Chuck, the owner. Chuck is one of those guys who really knows guns, likes his job and likes to talk with folks. I called him once to talk about MP5 clones and had a great experience with that (which is a blog series for another time) and then when I wanted to find out about this PDWR, he gave me a great price. Folks, how often do you run into somebody who does exactly what he says, follows up and even sends texts with all the tracking info? I have nothing but good things to say about Chuck and have now ordered two roller locks from him (this PDWR and a POF-5). You can either visit his website, email or call him at (305) 923-6560. Chuck shipped the rifle to my FFL – Scott Igert of Modern Antique Firearms. Another man of integrity and deep knowledge that I profoundly respect and recommend to anyone who is looking for an FFL in the Southwest Michigan or Northwest Indiana area or is considering buying one of the many unique firearms that passes through his shop in Benton Harbor, MI. So, I ordered early in the week, Scott had it by Friday and I was there on Sunday to pick it up. The two first things I noticed were the weight and the big magazine for holding the .308 (7.62×51) rounds. I’ll tell you what I did to the pistol in the next post but I will say this – it ran like a top. Not one single problem after almost 200 rounds but that is a story for another day. If you find this post useful, please either buy something using one of the links to eBay and Amazon or click one of the AdNow advertisements. EBay and Amazon you need to buy something, AdNow pays for each link you visit – no purchase needed. With Amazon, if you click on one of our links and then buy something else – even unrelated stuff like clothes, electronics and groceries – we get credit and it would be hugely appreciated. Doing something like the above will help us fund continued development of the blog. HK PTR 91 G3 GREEN BUTTPAD 5 PK. German G3 Magazine Pouch Bag Flecktarn Camo HK, Real Bundeswehr Mint Unissued!! Shooting the PTR PDWR - So Cool!